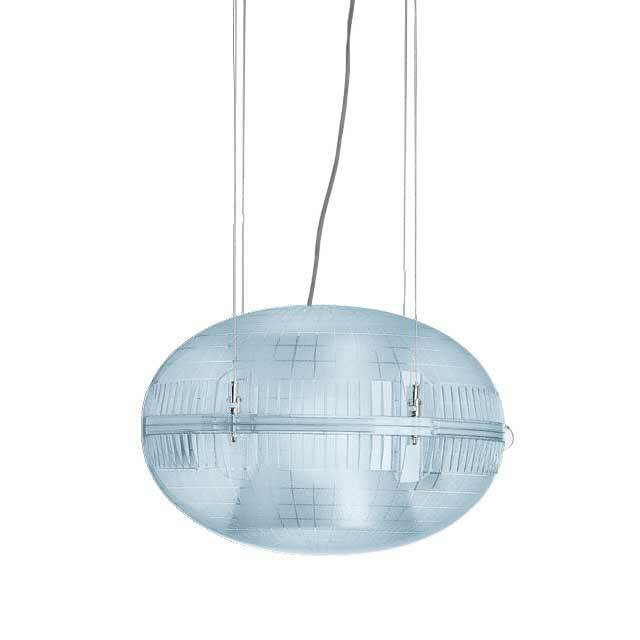 Pendant luminaire for direct lighting. Luminaires have two polycarbonate shells with a partial satin-finish. The shells are closed with special supports that are hooked to suspension cables (ordered separately as accessories). The joint between the two shells is water-tight thanks to a silicone gasket located around the light distribution perimeter and by a M12x1.5 nickel-plated brass cable-clamp for the exit of the power cable. Microperforated, polished super pure aluminium reflector. An aluminium support plate houses the light source and the control gear box. Suspension cables equipped with a system for highly precise adjustments.